Thanks, happy to be a member! This is definitely good advice: develop a plan and write as you go. It takes a lot to break bad habits and start working this way. Thanks for the welcome! I’m using tinyhabits.com to help me take baby steps in making new good habits. 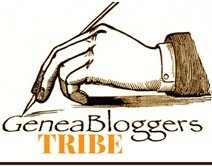 I found you through Geneabloggers, too! I am just like you. I get super distracted. It doesn’t help that a lot of branches of my family came from the same places, so it’s easy to jump from family to family to family and forget what I originally set out to do. Lately I’ve found that it helps to set a goal. Maybe work on one or two surnames at a time. Right now I’m able to stay very on track with my West family line because my Papa West is getting older and frail and I want to have great stories to share with him when I visit him at his assiste living center. I’m really hitting it hard, because – sadly – who knows how much longer I’ll have to sit and tell stories with him? Pleasure to “meet” you. Happy detecting! Great to “meet” you, too. Because we have two family reunions coming up soon, those are the branches I’ll be concentrating on. Hope to stay on track so I can have more info to share. I think getting distracted is half the fun! You sound as “organized” as I am every day!! It’s certainly an uphill battle. I’m trying to set more realistic goals so that I can achieve them more easily. :Looks like you’re doing what you love. Have fun getting lost in the past! Since having grandchildren, I’m so aware of how many stories need to be preserved for them and other family members. If we all share what we know, what a wonderfully rich family tapestry we can weave. Thanks for commenting. I’m trying to follow more blogs like yours, so interesting.